Studies of the prevalence of Alzheimer's disease and other dementia in the United States estimate that 14% of those over age 70 are affected, and that prevalence increases with age, exceeding one-quarter of persons over age 80 (Corrada et al. 2010; Hebert et al. 2013; Plassman et al. 2007). Alzheimer's disease accounts for close to three-quarters of persons with dementia (Plassman et al. 2007). Studies from United States and European populations find evidence for declines in the rate of cognitive impairment (Larson et al. 2013), but there is widespread agreement that the overall growth of the older population and increases in persons living into their 80s and 90s will result in more persons with dementia in the near future. The link between cognitive functioning and disability is well-established (McGuire et al. 2006). Recent research also supports cognitive change as a precursor to physical function declines (Atkinson et al. 2010). Memory, disorientation, and other features of dementia affect a person's ability to perform everyday activities and over time often lead to complete dependence on others. The implications of population aging for increases in older persons with dementia and the impact on families, which will be the mainstays in caregiving, have elevated the need for policy-relevant information worldwide on needs for care and consequences for care providers (WHO 2012). The purpose of this report is to describe disability and care needs, and some aspects of caregiving, for older people with dementia using 2011 data from the National Health and Aging Trends Study (NHATS) baseline and the National Survey of Caregiving (NSOC). Drawing on disability measures from NHATS (Freedman & Spillman 2013) and a measure developed for NHATS that classifies persons as probable, possible, and no dementia (Kasper et al. 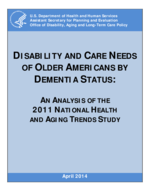 2013a), we examine variation by dementia status for several topics: activity limitations and assistance; demographic characteristics and residence; caregiving resources; and support available to or sought by caregivers to individuals with dementia.